The only excursion of its kind in the city, a Charleston Ghost and Dungeon Walking tour is a behind-the-scenes glimpse into the mysterious and frightening world of the city's Haunted Historic District. Twilight and late-night tours take you to some of the most renowned sites of paranormal activity. Famous for its historic antebellum architecture and hospitality, Charleston attracts millions of visitors each year. 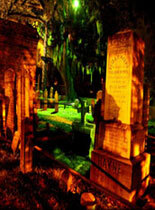 A Ghost and Dungeon Walking tour enables you to hear chilling tales of voodoo and the macabre while you experience the dark side of the city's graveyards, churches, back alleys and dungeon. 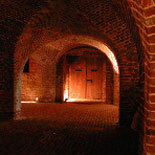 You have exclusive access to this attraction during the fascinating Charleston Ghost and Dungeon Walking Tour. The only tour company that can take you inside the cemeteries and dungeon, Bulldog Tours was established in 2001 to raise funds to preserve the Old Exchange, which is one of the most historically significant buildings in the country. Committed to conserving the nation's rich legacy and important landmarks, a portion of each admission fee is contributed to the effort. They have raised well over $500,000 to support conservation of the Old Exchange and several other historically significant buildings in Charleston. The city's premier walking tour company is proud to provide exclusive access to several of The Holy City's most infamous locations. 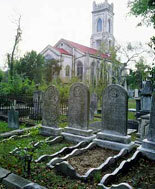 During this 90-minute walking tour, you will visit eerie houses and hear chilling tales of ghosts and Lowcountry myths. You can explore the notorious provost dungeon, which held infamous pirates and patriots during the British occupation. If you dare, make a reservation today to obtain an eTicket for a Bulldog Charleston Ghost and Dungeon Walking Tour, a chillingly entertaining and fun stroll through the dark and mysterious past. Available March thru Nov only. 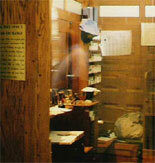 Closed Dec, Jan and Feb. Tour departs Tues thru Sat at 7:00 pm & 9:00 pm. Closed on Thanksgiving Day. Please arrive 15 min before departure time. Remember to allow time for parking. Bulldog Tours ticket booth is located at 18 Anson St. Charleston, SC 29401. Metered parking spaces are available, but limited throughout the Historical District. Parking available in a paid lot or park at the Visitors Center. Park at the Visitors Center then ride the Downtown Area Shuttle (DASH). Parking garages are available and located around The City Market. Free parking is available at the Historical Jail. Child Ticket: 7-12 years old. 6 and under are free. Reservations are required at least 24 hours in advance of desired tour time. If you need to change your tickets, you can do so with a minimum of 24 hours notice. Walking tours cover about 3/4 mile. A camera is highly recommended. Tours happen rain or shine, unless there are severe conditions.